This magnificent townhouse is located above the ocean, enjoying panoramic sea view, above the Praia da Areia Branca, in the county of Lourinhã. Although cross country downhill is a much shorter distance, Praia da Areia Branca is about 2,5 Km distant by road. Here you find a wide choice of bars, cafes, restaurants and shopping facilities. Lisbon is 70 Km to the south. 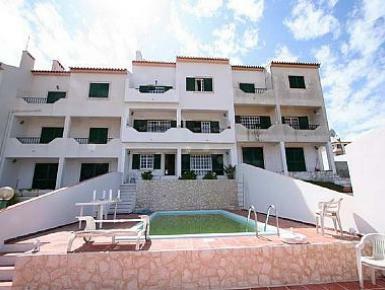 The three storey townhouse has a small garden in the front yard and a lovely swimming pool (8 x 4 m) with a partial sea view, surrounded by a large terrace with pool furniture and BBQ.